The Inter-Mountain photo by Edgar Kelley Davis & Elkins’ Colleena Burdock looks for an opening against Malone Saturday at the McDonnell Center. ELKINS — A strong showing from Robin Campbell helped power Malone University to a 66-59 win over Davis & Elkins Saturday afternoon in G-MAC action at the McDonnell Center. Campbell finished the contest with 15 points as the Lady Pioneers (11-12, 9-8 G-MAC) overcame a 31-28 halftime deficit with a 19-13 scoring edge in the third quarter. 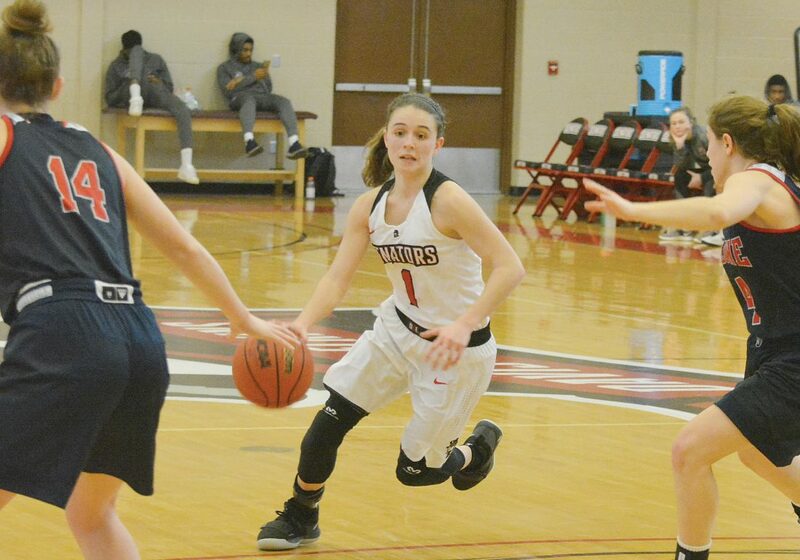 Malone took a 47-44 lead into the final period, where it outscored the Lady Senators, 19-15, en route to the victory. Campbell added five rebounds, five assists and four steals to her stat line. Madison Hunter followed with 11 points and Paiten Strother scored 10. Jamiyah Johnson’s double-double performance of 15 points and 13 rebounds led the way for D&E (6-15, 5-11 G-MAC). Colleena Burdock also reached double figures for the hosts with 12 points. Sydney Nestor chipped in nine points and Kali Wilbburn hit for eight. The Lady Senators will return to action today at Salem for a 5 p.m. contest. PHILIPPI — The Alderson Broaddus University women’s basketball team dropped a 75-42 decision to Walsh Saturday afternoon at the Rex Pyles Arena. Jeana Weatherspoon led the Lady Battlers with 14 points and six rebounds. Tatum Kress scored six points, while adding three steals and a block. Yasmin Norman added five points and three rebounds, while Yolanda Florida scored four points with four rebounds. ABU will play host to Ohio Dominican at 5:15 p.m. on Thursday for another league contest.